Description: Cheddar cheese dip with sour cream and onion, "bacon", dill, and subtle spices. 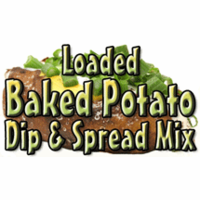 Makes a fantastic potato chip dip and a great baked potato topper! Features: Gluten Free. Vegetarian. Made from scratch, in small batches, from our own original recipe in Ohio. Abbreviated Ingredients: sour cream & onion powder, orange cheddar cheese powder, imitation bacon bits, seasoned salt, herbs. Contains milk and soy. Packaged in a facility that handles wheat, milk, soy, egg, peanuts, and tree nuts.